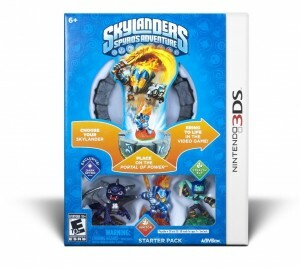 Skylanders Spyro’s Adventure … 3DS! A few months back I gave my impressions of Skylanders and talked about why I liked it so much. Over the holiday break I decided to pick up the 3DS version of the game, despite still working through the 360 version along with a sizeable backlog of other games. I passed over this one initially when researching which version of Skylanders to get, but knew I would come back for it eventually and I’m really glad I did. First off I should mention that the 3DS version of Skylanders is almost completely different from its console counterpart. The story isn’t the same and the gameplay is VERY different. The console version of Skylanders is more akin to a hack and slash RPG like Marvel Ultimate Alliance, whereas the 3DS game is an action platformer and is reminiscent of the way Crash Bandicoot plays in a moving forward perspective. In the majority of the games levels you seem to travel forward, fighting monsters, collecting stuff, platforming, etc. Maybe it’s nothing like Crash Bandicoot but it’s the first thought that crossed my mind. The combat and movement in Skylanders 3DS is actually something I prefer over the console version. Along with being able to actually jump, there is a sprint button and two attack buttons, which let you pull off some neat moves and attacks. Your Skylander even unlocks more abilities as he levels up. I’m not terribly far into the game yet, but from what I’ve seen there doesn’t seem to be any branching-off specialization path for your Skylanders, unlike the console version. That kind of bummed me out as it was one of my favorite surprises in the console version. One thing that I do like is how unique each character feels. I tried out maybe 10 or so of my figures and each one seemed to play a little different and each had its own unique abilities. There didn’t seem to be any rehashing. Speaking of figures, any Skylander you already own would work with the 3DS version. They actually work across all versions, as I probably mentioned in my original post. I was actually pleasantly surprised when I scanned in my favorite figure and he came over at the correct level and wearing the same hat I put on him in the Xbox version. I was also able to use my adventure pack figures to bring in new levels to game. I don’t know about any body else, but I just really dig how these toys work cross platform like that. It’s very cool. Probably the only real negative to the game is the lack of any kind of multiplayer. There is no Vs mode or Co-op mode, which the console version has. This might be a deal-breaker for some people, as the multiplayer aspect was a key feature. This is where the cross platform ability of the figures comes in nice. You could always take your characters to a friend’s house that has the console version. So is this really the definitive Skylanders game? It’s a great addition to the Skylanders experience, but if you want a more rounded game with co-op, multiplayer, and more diverse character customization, I would go with the console version. That said, I find the 3DS version to be superior in a few ways (combat and platforming are better on the 3DS) and it happens to be one of the better experiences you can currently get on the 3DS system. The graphics are fantastic, the action is great, lots of polish, blah blah blah. I want them to release more figures. Go buy it. Cool I didn’t realize the 3ds version was so different. After your last review of Sklanders I got the PC version for my daughter and I to play. We know have an almost complete collection of skylanders. Love the game and you just justified my daugther getting a 3ds. Yea my kids (and I) love the xbox version. Good to know about the DS version. Thanks Graev.